Flip the V200 over and you will not be presented with the typically red glow common to optical mice of yore. Instead, Logitech has chosen to use an infrared LED as an illuminator. While this is invisible to you or I, the camera in the mouse is quite sensitive to it. I don’t really see any major advantage to this beyond, perhaps, it looking a bit classier at meetings. One wheel does it all. It spins, it tilts, it even depresses (in a good way, not at all like getting a drink thrown at you). There are currently two choices in the land of scroll wheels, smooth or chunky. The V200 subscribes to the later, classically chunky wheel. It has a good sized wheel with distinct detents as you rotate it. The latest Microsoft Explorers (3.0) have switched to a smooth scroll wheel, lacking the distinct detents. If all you do is scroll through web pages, then the smooth movement of the Explore is nice. As in so much of life, the winning here is determined by your preference and how you plan on using your mouse. If, on the other hand, you use the wheel to scroll through distinct choices (dropdown boxes, weapons in a video game) then the feedback that a wheel like the V200’s provides is invaluable. Maybe I am spoiled by high-resolution display or simply not cursed by enough massive spreadsheets, but I still could care less about the tilt feature. It sounds like a good idea and works as advertised, but I don’t think most users will bother. If I am going to be panning around something big, say a map or a picture, I want more control and speed than the tilt wheel provides. The Logitech V200 uses a 2.4 GHz radio. This is the same frequency band in which WiFi (802.11b & g), many portable phones, Bluetooth, microwaves and many other devices operate at. The reason so many devices are crammed into this small notch in the spectrum is simply, it is free to use. 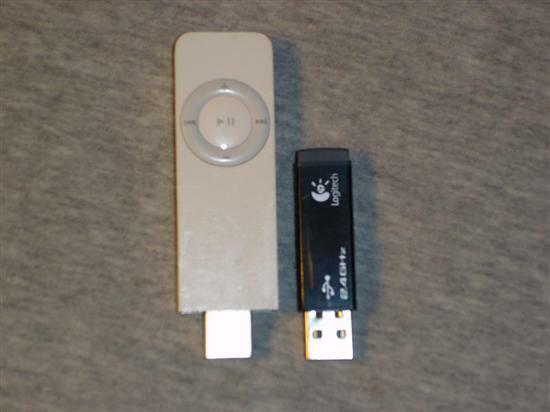 Logitech claims that this yields a range up to five times that of older designs (typically operating around 46 MHz). It does have an impressive range, somewhere over 25 feet line-of-sight, but then again so does my Explorer. 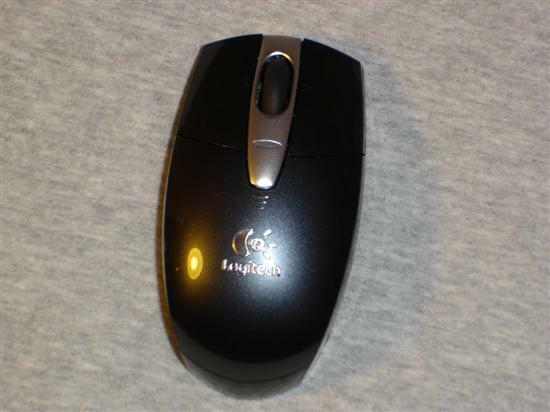 As you can see from the pictures, the USB receiver for this mouse is very compact. This is a good thing; I can even leave it plugged in while I am loading up my iPod Shuffle, which can be a challenge on my ThinkPad. . The news is not all good however. As you can see in the picture, the receiver snaps into the bottom of the mouse when not in use. Good idea. The problem is that it does not snap flush with the bottom of the mouse. This leads to the thing getting easily knocked off during transport. No damage is incurred, but it quickly becomes annoying and no doubt will lead to lost receivers over time.